Tonight, Kickstarter announced they had a security breach early this week, and they didn’t know until law enforcement officials told them on Wednesday night. Kickstarter CEO Yancey Strickler wrote a letter of apology to users that encouraged people to change their passwords to be safe. The letter was posted on the company blog and emailed to users today. 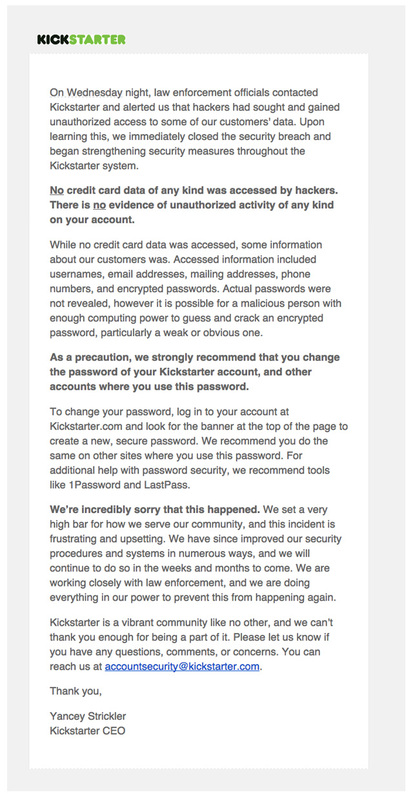 Kickstarter also explained that those users who used Facebook logins were not compromised during the breach.